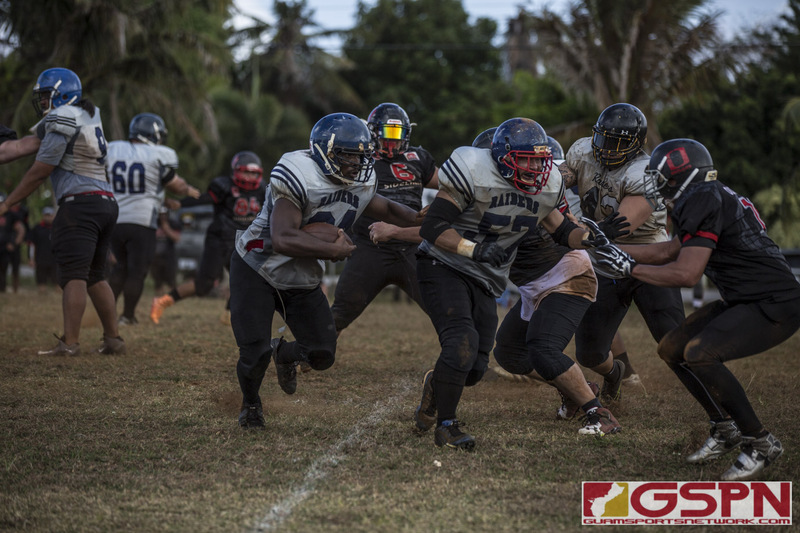 The undefeated Raiders took on the Outlaws Saturday in the second round of the Guam Varsity Football League and were able to secure a perfect record, closing out the regular season on a spectacular game from Jesse “Pumpy” Manglona who had 10 receptions and a rushing touchdown to lead the Raiders to a 27-2 victory. In their previous meeting, the score was kept close for the majority of the game. This time around, that would not be the case. The Raiders came out hot scoring two touchdowns in the first quarter courtesy of receiver Mitch Charforus and running back Dave Delgado. Player of the game, Jesse “Pumpy” Manglona, contributed greatly to the Raiders air game grabbing five receptions in the first half, one being for a gain of 42 yards to setup the Raiders for a passing touchdown by receiver, Storm Rosario. The point after attempt was blocked and scooped up by Gary Santos, who ran the ball 92 yards back to the house to get the outlaws on the board end of the half 20-2. “We’re a very versatile team. We have strength both on the ground and in the air. Danny [Manibusan, quarterback] sets us up really well with our routes, but we have to give it up to our O-line. Without them, Danny wouldn’t have the time in the pocket, and we wouldn’t have the holes to run through,” said Manglona on the keys to their offensively dominant victory. The defensive score on the blocked PAT attempt would be the only score for the Outlaws. Raiders’ defense, anchored by linebacker Allen Blend, locked up the Outlaws as the Raiders’ vacuum-seal coverage would keep the endzone out of sight for the Outlaws, forcing three turnovers in the second half. “Consistency was the main factor for us defensively. We just made sure that everyone was doing their assignments on defense and making sure we kept our heads in the game so that our tempers wouldn’t get the best of us. Our defensive unit is all about cohesiveness, and each individual was able to take care of their responsibility which brought us together defensively,” said Blend, veteran men’s league participant who celebrated his 48th birthday at the game. Pumpy Manglona would cap off the game with a rushing touchdown to end the game 27-2 and close out the Raiders’ regular season with an undefeated record. The Raiders end the season with the first seed going into the playoffs and will play the fourth seed next week in the GVFL semi-finals.